Cut your fake flower stem to the height of that little part of the shoe that goes between your toes. Hot glue the stem to the shoe and sew your toe guard around them. Guess what I'm making . 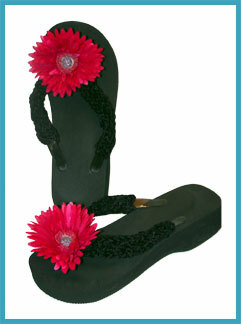 . . Flowery flipflops a cell cozy AND if I can find the right assortment of threads the scrap wrap!!! I love the sandals. I think that this is what we need for our Dude Looks Like a Lady contest at our Relay for Life. We are going for the win next year--starting our dress up plans now. I have my 10 year old granddaughter for a week in July, I have started teaching her to knit, this is a great project she can finish in one week and will like to wear. Great Post! Thanks for giving detailed description about blog.